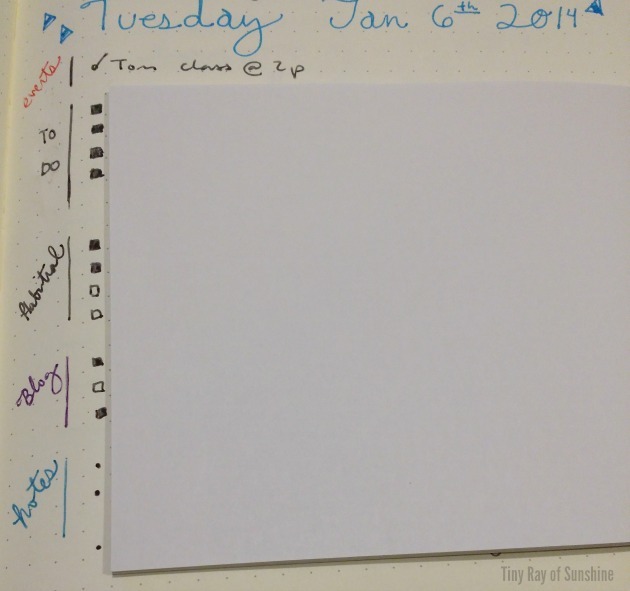 Today's tip is on categorizing your tasks to increase focus in the Bullet Journal. This helps me out when I want to focus on tasks based on their contexts. If you're familiar with David Allen's Getting Things Done, this is similar. Simply write down tasks that pertain to a certain context, or area, in your life and draw a line alongside the checkboxes. This is similar to what Ryder Carroll, the creator of the Bullet Journal, suggests but instead of placing a little signifier next to each checkbox to indicate where it goes, save yourself some time a place them all together at once. I know that some people use "@work" next to checkboxes to indicate where it goes or little icons (which I've done as well). This is just another way that saves time from planning for more time for doing. As an example, habits are their own series of tasks, as are home and work tasks. If you're like me and like to move on from the first thing on the list to the next thing on your list, but don't want it to be all over the place as, say "review worksheets, clean bathroom, make breakfast, etc." Give this method a try. It will probably lead to less confusion and better workflow.